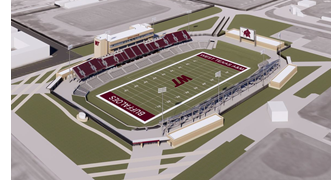 ​​​​ CANYON – Officials at West Texas A&M University (WTAMU) have broken ground on a new $38 million football stadium. The new Buffalo Stadium will be located east of the current soccer/track stadium and Jarrett Hall. The arena is expected to host 8,500 stadium seats with a maximum capacity of 12,000.